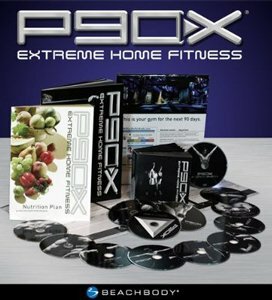 The P90X exercise program is probably the most popular fitness plan to burn belly fat and build muscle at home. P90X is a creative and dynamic program gets fat loss results for both women and men. The P90X Extreme Home Fitness Workout Program is popular for that one basic reason...It Gets Results. Period. Let's be realistic. You must put in the effort to reach the fat loss goals you have set. Yes, you will sweat...Yes, you will get out of breath...and Yes, you will get red in the face. P90x is all about burning calories to eliminate belly fat. P90X is divided into 30 day segments, and lasts for 90 days. You get a CD with different exercises for each week of a 3-week cycle, then you'll do a week of recovery to another creative CD. You will go through 3 cycles of exercise/recovery in the 90 days. Your P90X workout program comes with 13 different CD's. * You may find it beneficial to start with resistance bands in graduated strengths. Most women start this way. * Men find push up bars extremely beneficial. * Many men also purchase a doorway pull up bar for rapid strength increase. * A small set of dumbbells is also very helpful. Men usually find that a set of 10-20-30 lbs are more than enough. The women I talk with say they use a 5-10-15 lb set. * Some women purchase a Yoga Mat and Yoga Block, but a lot of men do not see a need for this equipment. * There's really NO NEED to buy supplements from the company or from your health food store. If you dump sugar and processed foods from your diet and replace them with fruits, vegetables, and solid protein sources (fish, turkey, chicken breasts) you'll be fine. One explanation for P90X working so well is because you are essentially training like an athlete. * To get the most out of your P90X, you must follow a sound nutritional plan. You must stop eating what you want and start eating to build lean muscle...much like an athlete. * Know that most people quit this program after the 30-day mark. It is ridiculous. You cannot neglect your body for years, workout hard at home for one 30-day cycle, and expect amazing results. That's not how it works. Before you purchase ANY home workout program, make sure you are committed to a more healthy lifestyle. P90X is a solid program and has gotten spectacular results for those individuals who are self-starters and will follow through. Does P90X work? Does it really get results?